A lot of us have been hoping the world would wake up to the realities of climate change in time to do something about it. But, alas, it’s not. We have long held out hope that society would embrace renewable energy as dirty coal and petroleum gets harder and harder to extract. A world that desperately scrambles to prop up what I call “Dinosaur Economics” (the backward-looking, fossil fuel-driven global economy) in the face of rapidly accelerating climate change is what David Holmgren calls the “Brown Tech Scenario” in his 2007 book, Future Scenarios. David Holmgren is not exactly a household name in the United States (are Bill McKibben and Michael Pollan household names yet? 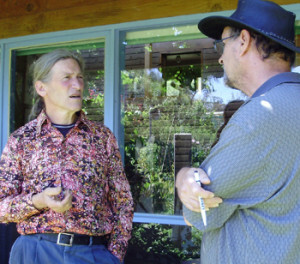 ), but he’s legendary in Australia as the co-founder of permaculture. It’s not easy being a legend. Holmgren handles it by spending a lot of time in his two-acre garden in Hepburn Springs, Australia and quietly churning out books and articles about how to make a difference when the world you were hoping for just isn’t going to arrive. Future Scenarios was a provocative look at possible futures for humankind. The four-scenario matrix was generated by two variables – climate change and the end of cheap fossil fuel (Peak Oil), measured against whether the impacts would be rapid or gradual. Hence, gradual climate change and gradual Peak Oil would produce Holmgren’s “Green Tech” scenario – the one most environmentally conscious Americans would happily embrace. Renewable energies fill the void of increasingly expensive fossil fuels and greenhouse gas emissions decline as a result. Lifeboats, on the other hand, is Holmgren’s world in the wake of rapid climate change and rapid depletion of oil. The economy fails, global warming devastates the planet and those of us who survive become extras in a global “Mad Max” remake. In between these are the “Earth Steward” and “Brown Tech” scenarios, created by rapid impacts from one variable coupled with gradual impacts from the other. What Holmgren is seeing after 30 years of observation and practicing permaculture is the Western world heading into Brown Tech: climate change heating up as oil reserves decline slowly. 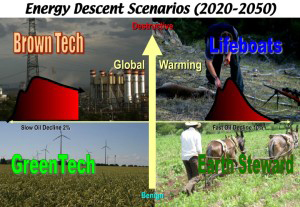 In his 2007 articulation of the Brown Tech Scenario, Holmgren imagined massive centralized investment by corporations and government to extract more energy out of lower grade non-renewable resources. Wars to secure fuel and food would increase and focus public attention on external threats. National power constricts consumption and focuses resources to maintain the nation state, in the face of deteriorating climate and reduced energy and food supply. In the past seven years, Australia has become the largest exporter of coal (sold mostly to nearby Asia) and possesses huge reserves of oil, gas, uranium and iron ore. The U.S. has plowed hundreds of billions of dollars into costly unconventional extraction projects like deep-sea drilling, shale and tar sands processing, and fracking. This massive investment in Dinosaur Economics paused briefly for the Global Financial Crisis in 2008, but surged again in 2009, thanks to the Wall Street bailout. President George W. Bush’s near-final act in office was to ram through Congress a $700-billion subsidy to the investment banks. At the time, I thought he did this to help his buddies on Wall Street. Now, I’m beginning to wonder if he was actually moving to save the global oil industry, which depends on the global financial system to operate. In the unfolding Brown Tech Scenario, Holmgren expects to see central governments exert more control, abandoning free-market ideologies for command economies. Climate change-induced natural disasters will bring governments sniffing for more control in the name of public safety. The U.S. investment in spying and other security-state infrastructure is a warning to all. Holmgren wouldn’t be surprised to see government intervention in the face of food shortages – with subsidies for the trucking industry and ration cards for the people. Brown Tech is not a very hopeful scenario, but Holmgren articulated a strategy in his December essay, “Crash on Demand.” Since global economic collapse (the result of people unable or unwilling to consume more and more resources) is about the only thing that will halt greenhouse gas emissions, why not sooner than later? Dinosaur Economics is a debt-driven bubble ready to burst – why not get out our pins? Instead of laboring to build mass movements where 90 percent of the population must rise up to shake off the chains of their masters, how about building a mass critical enough to crash the system? Holmgren estimates it would take only about 10 percent of the world’s middle class. This relatively small group of party crashers would have to take this seriously. They would have to reduce consumption (including debt) by 50 percent and move 50 percent of their assets into the local economy. That investment in community-based economics would be crucial. People need to eat and a parallel local food economy would be absolutely necessary to keep crash on demand from spiraling down into the Lifeboats Scenario. This is the essence of permaculture for David Holmgren. He’s been working on this for 30 years – a nature-connected self-reliance that helps nurture a giving-based community. The Transition movement is crucial to the future of sustainability. We took our camera on the road to Northern California, Oregon and Washington where we interviewed permaculturists on the cutting edge of transforming whole communities. Click here to preview, download or purchase a DVD!